Have you ever re-used hair from a previous hairstyle to make a new one? I did and this money saving technique gave me a new style. It was from this protective style that I had in for about a month. After I took it out, I wondered what my next style would be. As I was unraveling the hair I took one look and said hmmm…. What would happen if I blew it out? 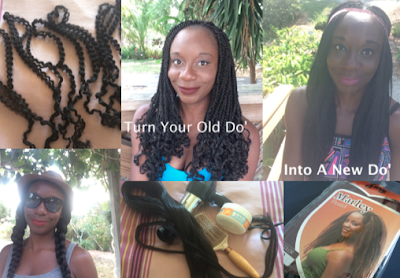 I blew out another brand of hair (you can check it out here) and I was comfortable doing the same with the Marley hair. I first tested out a few pieces to see what it would look like and I was happy with the results. I really didn't want to just throw it away especially when I know I can create another style out of it. Welcome to the adventures of someone who wants to look cute but her budget has other plans. So again, I got creative and worked with what I have. *If you use a lot of products, be sure to wash the hair by soaking in water and gently removing any lints and let it air dry. Have you re-used old hair to create a new style? Hey that's wonderful! Thank you and thanks for stopping by.